First off, have you bought a copy of Aaron Pogue’s Ghost Targets: Expectation yet? I hope you have. Second, I went to Half Price Books with my family this weekend and so have extended my reading list for this year. But that can only be good, right? More books for me to learn from and enjoy. Now, on to the real reason we are here. The two books that I read last week were severely dissimilar: John Steinbeck’s Of Mice and Men and Scott Westerfeld’s Leviathan. Let me just start by saying that I feel unqualified to talk about Steinbeck. I know, I delved right into Shakespeare, but Steinbeck is a man of staggering genius that I can’t begin to dissect. I tried to just enjoy Of Mice and Men as a short story, but I finished it knowing that way too much of what Steinbeck intended to convey had gone over my head. And that kills me. Anyway, it was really a really depressing and beautiful snapshot of 1930s America. Now let’s move on to Westerfeld. You might recognize him as the author of the Pretties series, which I touted as one of the worst ways to waste a few hours. I’m hoping that this series turns out better, because so far I’m liking it. It’s a steampunk version of World War I. One main character is an airman in the British fleet, and the other character is the prince of Austria. While the story was interesting and gave me some good history lessons, the world-crafting was obviously the biggest pull for me in this book. I, like most admirers of the steampunk genre, love the romantic feel of the futuristic steam engines. I find it kind of weird that you can call it steampunk, though, when this book is set only a few years after the height of the steam engine. But whatever. 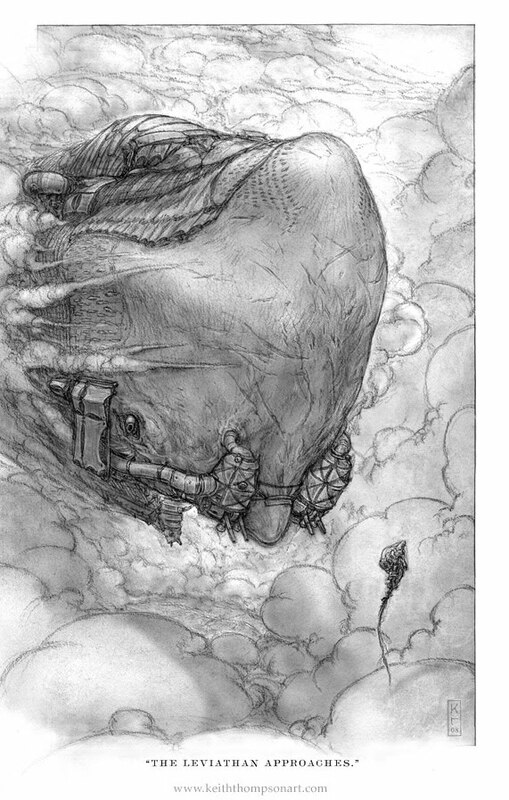 Keith Thompson provided some really amazing illustrations to show off Westerfeld’s inventions. I would stare at each one for a few minutes, just soaking in the details of every picture, trying to gain more sight into this world. I’m a little afraid to get the second book, Behemoth, just because of my track record with Pretties, but I think when it comes out in paperback I’ll give it a try. Because steampunk is cool! This week I’m plowing through Ken Follet’s newest novel, Fall of Giants. It looks like I’ll be getting yet another healthy dose of World War I history. Huzzah! Also hopefully I’ll have something to share with you soon about my adventures in writing. I’ll have to try Westerfeld sometime. So far, my only experience with steampunk was The Dragons of Babel by Michael Swanwick, and it was fairly disappointing. I like the concepts of steampunk — I just need to find a good sample of it. Do Naomi Novik’s Temeraire novels qualify as steampunk? I fell in love with the first one, His Majesty’s Dragon. No, Temeraire falls into the alternate universe category. I think Westerfeld is probably a good intro to steampunk. I’m trying to find some other books to see if I actually like the genre.